Parties with sleepovers are very popular with boys and girls aged eight to 14. For the parents, they do mean a bit of a headache and a bit of a worry. That’s why we would like to share with you some ideas on how to minimize the trouble and bring more fun for kids. Move the sleepover party outdoors, to the backyard. Boys will be excited to sleep in a tent (space permitting), or simply under the stars in their sleeping bags (weather permitting). Start the party with an active game to let their excitement out. Games like capture the flag, nerf gun war or red rover would do. However, if you want something more hilarious, check the buzzfeed. After the sunset, add more to their adventure with a flashlight treasure hunt, and finish the night with the action movie shown on a big inflatable screen. Older boys cannot live without computer games, and even when they get together, they play or watch others playing. As a parent, you do not want them to sit in a dark corner over the small tablet screen during the party. The option here would be to move computer games outdoors as well! Connect PlayStation, Xbox or Wii to the big screen, so that the boys could enjoy their favourite games and stay outdoors. Moreover, if you pick up active games using Wii or Kinect, they will have all the motivation to start moving! The girls’ slumber parties are different, with much effort spent on décor, invitations, and costumes. Put as much responsibility on children as they can master; they will have more fun and better memories of the event. Add some art and craft activities during the party. Painting pillow cases, making dreamcatchers, candles or lanterns are all great ways to entertain friends. Ask the guests to make a film on a given theme. Suggest them to use the real digital movie camera if they are old and responsible enough. Alternatively, simply use an ordinary smartphone – the results will be great as well! Use your outdoor cinema system to watch the freshly made movie with the rising movie stars on a big screen – the success is guaranteed! Karaoke or a disco party will be more fun if moved outdoors as well. Just ensure the ground is even and the scene is decorated. 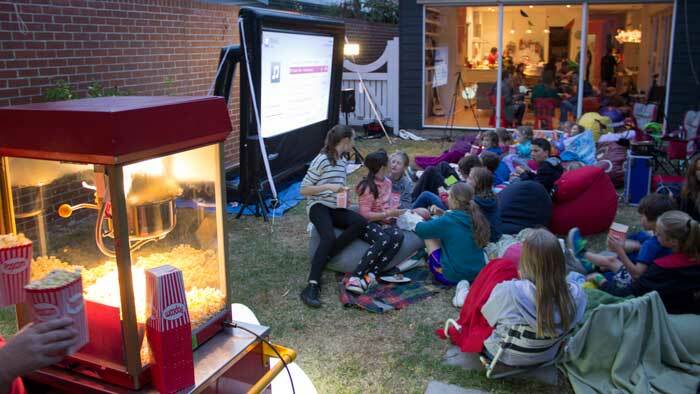 Finish the sleepover party outdoors with the movie – organise the backyard theatre with beanbags, futons suitable for outdoors, garden furniture, or simply suggest guests to bring their own sleeping bags. With the help of an outdoor movie system, you can make more use of your backyard and have less mess in the house during kids’ parties. You will get to know your child’s friends better. Moreover, you will have peace of mind knowing kids are having fun in a safe environment. But most importantly, they will have a very special and original party they will remember for years. And hey, you can celebrate your birthday with a sleepover party outdoors enjoying a backyard home theatre, too!